Harsha N. Perera is an assistant professor of educational psychology with the department of educational psychology and higher education. Prior to this appointment, he was a strategic lecturer in educational psychology and measurement at the University of New South Wales, Australia. He has also held a tenured lectureship in educational psychology with the faculty of education, University of Southern Queensland, Australia, where he remains in an adjunct capacity. Perera has two substantive lines of research at the intersection of educational and vocational psychology. First, he examines the social cognitive processes through which young people choose specific educational and career pathways. Second, he researches the social cognitive processes through which teachers engage with their work, become satisfied with teaching, and, ultimately, remain in the profession. In addition, Perera has expertise in educational and psychological measurement and advanced quantitative methods. Perera has published in a number of top-tier scientific journals, including Assessment, Journal of Personality Assessment, British Journal of Educational Psychology, Learning and Individual Differences, Teaching and Teacher Education, Personality and Individual Differences, Journal of Vocational Behavior, and Frontiers in Psychology. In addition, he serves on the editorial boards of the Journal of Educational Psychology, Journal of Vocational Behavior, Frontiers in Psychology, and the Australian Journal of Career Development. He is a regular reviewer for several national and international journals. 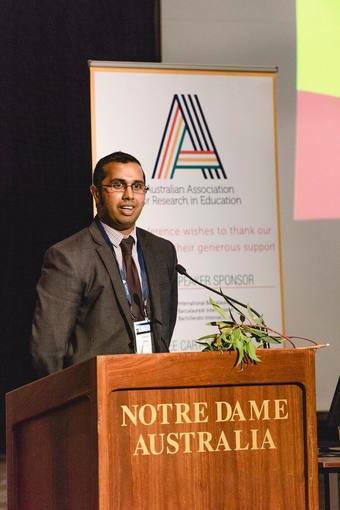 Perera is the recipient of a number of awards recognizing his research excellence, including the Australian Association for Research in Education Ray Debus Award for the most outstanding doctoral dissertation in education across Australia; the UTS Chancellor's List Award for outstanding doctoral research; and the American Educational Research Association Division E Outstanding Dissertation Award. Think about the so-called "story problems" you studied in algebra and other math classes. How many of them dealt with, say, two trains which, no matter how far they traveled, could never catch your attention? Were you the kid that asked (or silently wondered) "When am I ever going to use this stuff in real life?" Did you ever get the answer to that question, or were you left pondering it while trying to solve confusing, seemingly irrelevant problems?